Joe Daleo, the number one guy over at Icecap.us, recently sent me the CDIAC (ice core) CO2 data as criticized in Beck (2007) and asked me what I made of it. Now, this data has been pored over by the great and small, so should we expect any revelations along the lines of “Has CO2 actually decreased?” Well…see below. I don’t often see this data pictured in one particular way that I find instructive, so I wanted to show it to you. You’re probably used to seeing CO2 through time in plots very much like this cartoon. The black line is the actual CO2 data, the two background colors representing, before 1958, estimates of CO2 based on ice cores, and after that on measurements from Mauna Loa. The green line is a suitably normalized estimate of the human population. Both increase at what looks like roughly the same rate. Right? Side note: these are estimates, and, ideally, both lines would have a “plus or minus” line plotted above and below so that we can see the graphical representation of the uncertainty in the numbers, which might, or might not be, substantial. I don’t know what the error is for either curve, but we’ll ignore this not inconsequential problem today. Now let’s take the exact same data and plot it in a slightly different way. Click the image for larger version: you may wish to right click and “Open Link In New Window” (or words like that) so that you can view the graph and read its description at the same time. Or download a printable pdf version here. This graph is complicated, so let’s take our time to understand it. The horizontal, or bottom, axis is still time. But now the black line is the yearly change in CO2. For example, in 2007 the CO2 was measured to be 383.32 parts per million (ppm) and for 2006 it was 381.83 ppm. The change, which was an increase, was 1.49 ppm. We measure this change for each year and keep the results, so that we can see the rate of increase (or possible decrease or no change) for each year. We could plot this raw change through time, but a lot of detail is hidden because the increase is exponential (the same shape as the cartoon plot above). Instead of a raw plot, we take the log of all values so that detail can emerge. This should not change conclusions based on the data in any way, and it does allow us to see it better (technical note: the value of 1.2 was added to all values because some changes were negative and, without using complex numbers, we cannot take logarithms of negative numbers). The detail pops now, doesn’t it? The first thing to notice is the marked qualitative and quantitative differences in the Mauna Loa and Ice Core estimates. The two methods are obviously not directly compatible, a fact which was hidden in the raw (non-differenced) plots. This makes decisions about the rate of increase of CO2 across the two regimes trickier than is commonly thought. First concentrate just on the Mauna Loa regime. The rate of change has been over-plotted by a simple regression line, which fits rather well (I’ll spare you the formal statistical tests: but trust me). That is, the model of exponential acceleration of CO2 into the atmosphere is well supported over this range. This is acceleration because, recall, that this plot of the rate of increase of CO2. To explain that further: suppose, every year, the exact same amount of new CO2 is added to the atmosphere. The graph for that would then be a straight line on our plot, which is roughly the case for the dates 1750 to 1800. During that time, about 0.12 ppm of new CO2 was added each year. At least, according to the estimates from ice cores. To emphasize: if our graph shows a (rough) increasing line, as it does in the Mauna Loa regime, then the rate at which CO2 is being added to the atmosphere (according the chemical measurement method used) is increasing. If the graph shows a straight line for certain periods, then those periods contributed the same amount of new CO2 each year. But if the graph shows a (rough) decreasing line, as it does in several place in the ice core regime, then the amount of new CO2 being added to the atmosphere is decelerating: new CO2 is still being added, but at a slower rate. There are even times when CO2 has decreased, i.e. removed from the atmosphere, from year to year (according to the measurements used): these are the points below the dotted-dashed line at 0. These times were roughly 1820, 1831-1838, times before wide-scale industrialization, and 1942-1944. 1942 to 1944? This was certainly a time in which the entire world, if you recall, was intent on adding as much of everything to the atmosphere that it possibly could. So this result is strange. One possibility is measurement error: something might have gone wrong in the way the ice cores were processed. It is usually thought that the measurement method used for ice cores is accurate and unbiased and so on. So suppose that is true. Then it cannot have been the war that accounts for this dip in the mid-1940s, because there is no similar dip around the years of The Great War. In fact, during that time, the rate of new CO2 was accelerating, as indicated by the regression fit over the years 1898 to 1941. Just for fun, I have drawn the two regression lines, for the ice core and Mauna Loa regimes, extending forwards and backwards through time (these are the light dotted lines). What I learn from this, again, is that the two measurement methods are probably not compatible. On to the human population, again pictured in green, but here, like CO2, we are looking at logged differences in year to year population, suitably normalized for ease of comparison. Data from 1950 to 2007 was available for each year from the U.S. Census Bureau; from before that, I used, Lord help me, Wikipedia. Estimates before 1950 were sparse, generally only available every 50 years or so. I fit a variety of splines (B-splines, polynomial, etc.) and even a strict linear interpolation to estimate the missing values: all methods gave substantially the same results. What we have to say about human population isn’t that crucial, anyway. You first see two dips, one around 1915 or so and another from the late 1940s. These dips certainly are from the two World Wars. Population was still increasing then, but, obviously, at a slower rate. The deceleration from the late 1960s to present time is well known to demographers: while population is still increasing, the rate at which it is doing so is dramatically decreasing, particularly in Enlightened countries. The odd dip around 1960 is probably due to the utopian joys of communism: Mao’s great leap forward (into the grave, apparently). Ok, that’s the data. But it only takes us so far: human population numbers are only a rough, very rough, proxy of our ability to add CO2 to the air. For example, during 1831-1838 the human population was accelerating but the CO2 was decelerating! Human population also dropped during World War II, the same time as a measured drop of atmospheric CO2, as mentioned above. But a similar deceleration in human population in World War I did not find a concomitant deceleration of CO2. What to make of plots of people versus CO2? My guess: not much. Particularly since current rates of population are decelerating and will continue to do so, yet CO2 rates are accelerating. The correlation between human population and CO2 is just too noisy and inexact to be of much use. I am not an expert in measuring atmospheric CO2, but I will make three conclusions which I believe are well supported statistically. (1) The two methods of measuring CO2: ice core reconstruction and air-chemical, are not compatible. One is over-estimating or one is under-estimating. I have no idea which is which; whether, that is, historical numbers should be adjusted higher or current numbers should be estimated lower. Beck (2007) and Jaworski (2007) argue that the historical numbers are low. (2) We should increase our uncertainty in models, such as global climate models, that use this CO2 data as input, particularly if they use the data which spans the two measurement regimes. (3) There are odd discrepancies, unexplainable through human population correlations, in the ice core data. At times CO2 has been measured to actually decrease. This might be true, but the times of the decreases are not consonant with human activities. Clearly, measurement error is a likely possibility and should be investigated. Lastly, of course, there is Beck’s paper, which is essential reading on this subject. I do not have Beck’s data, just the ice core data: some of the same signals, though not the same in magnitude, in the CDIAC data are also in Beck. His contention, supported by data, is that CO2 has been higher in the recent past. Like a peak around 1940 or so, declining afterwards: the decrease we also see. I might be wrong about all this, so I welcome comments and discussion. Beck, E.G., 2007. 180 years of atmospheric CO2 gas analysis by chemical methods. Energy and Environment, 18, No. 2, 259-282. Jaworowski, Z., 2007. CO2: the greatest scientific scandal of our time. EIR: Science, 16 March, 38-53. Direct chemical measurement of atmospheric CO2 has been performed (and records made) since the early 1800’s. From what I’ve seen claimed, the lab records don’t agree with the ice core measurements either. This may be a dumb layman’s question, but I am curious whether there are any post 1958 estimates of CO2 concentrations based on ice core samples? First, I do enjoy your Blog, it is informative and sometimes amusing. Relative to your conclusions, I would agree that the ice core and atmospheric measurements are undoubtedly not directly compatible. 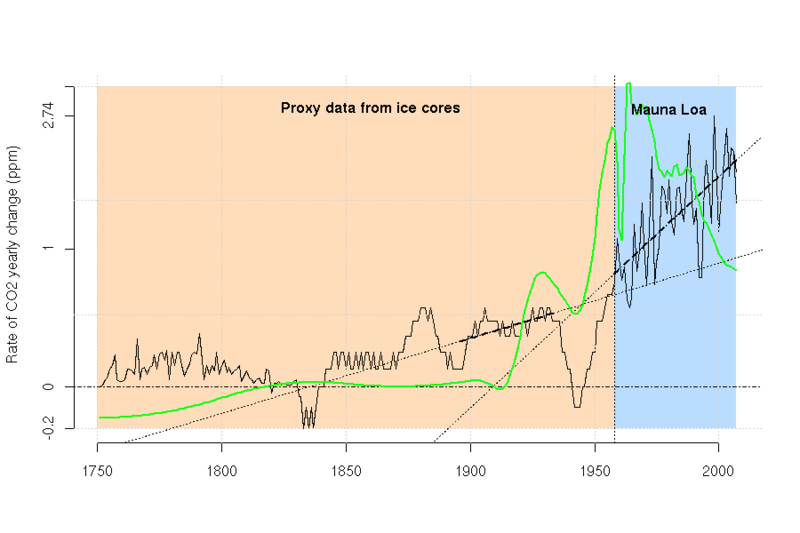 One thing that struck me about the ice core data is that there appears to be a change in the manner in which the rate of change data varies beginning in approximately 1840. Prior to this time, there is rarely any year that is exactly the same as the prior year, (i.e., no step-wise changes) whereas after 1840 there are several stepwise changes. Based on my experienc looking at a variety of instrumental data, you usually get such stepwise patterns when you are very close to the instrumental detection limit. It may be that because of the greater possibility of continuing atmospheric interaction with younger ice, the ability to detect changes is reduced. I am not sure what the point of comparing changes in human population to the CO2 level was, unless there is some alleged link between human exhalation of CO2 when we breathe to increasing atmospheric CO2 concentrations. A better comparison would have been to the estimated changes in fossil fuel use over time. Finally, you never approached the question posed by the title of your post. Assuming some degree of accuracy and representativeness in both the ice core and Mauna Loa data, it would be hard to argue that atmospheric CO2 concentrations are decreasing although the rate of change may be less certain. You’re right about human population v. fossil fuel use. I meant to imply that as the population increases, so does the use of fossil fuels, but, of course, not necessarily at the same rates. I did not do a good job of explaining this. And you’re also right that I did not directly answer the questions; at least in a satisfactory way. So I may go back and change some of the text to say this: yes, at times, CO2 concentrations has gone down—if the ice core data is accurate, or if Beck’s and Jaworowski’s criticisms are valid. As anyone who has taken instruction in scuba diving knows, water absorbs atmospheric gasses. I have never seen any discussion by champions of ice core CO2 data about this. It would be easy to speculate that CO2 that was captured by falling snow and later entombed in the resulting glacial ice could migrate towards the surface, thus lowering the reading of ice. The ambient pressure down even a few hundred feet in snow compacted into ice is, what, over 1000 PSI? This migration rate would be affected by surface conditions such as the extent of cracking and ambient temperature. Having now looked at the BEck paper, one major fatal flaw in his methodology for attempting to construct a time-series jumped out at me. Just to give you a hint, using his methodology, it would be very easy to show that there has been catastrophic global cooling over the last 30 years. All I would need to do is take the annual average temperature from Miami for 1980-81, the average annual temperature for DC for 1985-86, the average annual temperature of Boston for 1990-91, the 195-96 temps from Ottawa, etc.. His time-series is not valid since it doesn’t represent the variation over time at a single location (or even very closely spaced locations). Whether the ice-cores or Mauna Loa CO2 measurements are accurate in an absolute sense may be debatable, but in a relative sense they do accurately represent the change in CO2 over time at that location. The second problem I see with Beck’s work is that he doesn’t answer the question of whether the data points are representative of the average atmospheric CO2 concentrations. Certainly, we can a priori conclude that there will be a much greater variation in near surface/low elevation CO2 concentrations due to both vegetative respiration, interaction with water bodies and anthropogenic effects. High altitude/above treeline measurements such as Mauna Loa or high latitude ice core measurements which are far removed from such local effects should see much less variability. Regardless, combining what amount to point measurements from various locations to create a time-series is a fundamentally fatal flaw with Mr. Beck’s analysis. I suppose the usual argument is that CO2 diffuses throughout the atmosphere fast enough that it matters less where you measure it; at least, as long as you are interested in yearly means. Beck actually does discuss positive urban biases in CO2 levels for some locations. Plus, if, as he did in some sub-analyses, picked just one site, little affected by urban bias, then the changes at that site are indicative just as they are at Mauna Loa. I wouldn’t yet say these flaws are fatal. For example, the rates of change around Mauna Loa may seem exaggerated because they are essentially “on” the ocean (because warmer water outgases more CO2, etc. etc.). In that sense, ML has no more qualification for being “the” site than any other. In fact, just using one site may lead, and probably has lead, to an underestimation of the (short- and long-term) variability of CO2. And don’t forget that just the same sort of thing happens to create a “global mean temperature” time series. Points from various locations are averaged together etc. So there’s not inherently wrong about this, it just has to be done well. CO2 is a well mixed gas which means the geographical distribution of the samples is irrelavant. If it was relevant then the CO2 graph which splices data collected in Hawaii onto data collected in Antartica would be a complete fraud. The flaw in the Beck study is the lack of information about local conditions for each of the samples since CO2 can vary significantly due random local effects (i.e. proximity to farms, cities etc). However, it is impossible to quantify the unknown and it is not reasonable to assume that the local effects would have always biased the measurements upwards. The blue part of the graph reminds me of a couple of papers I have seen lately – this DCO2/dt thing relating to temperature. Im just thinking it is interesting that I have seen 3 “papers” using dCo2/dt. Any comments on this? Bill and Raven – I am aware that, in theory, CO2 is well mixed in the atmosphere (or at least the troposphere as a whole. However, since most sources and sinks (natural or anthropogenic) are near surface, one can conclude, a priori, that there will be a greater range of concentrations found near surface or near potential sources or sinks than distal to such features. Further, I did look into some of the original references provided by Beck. There was very little on the sensitivity and calibration of the CO2 measurements from the 1800s, but from one reference, it sounded like the accuracy was +/- 100 ppm, which isn’t great. I am not going to say that the 290 ppm pre-industrial level commonly accepted is the absolute truth, but I don’t think I would rely too much on a lot of the older data. I do agree that splicing the ice core data onto Mauna loa data w/o calibrating the ice core data based on a reasonable period of overlap would not be scientifically valid. My biggest issue is that a valid time series should come from a relatively continous set of measurements at a single location. From reviewing Beck’s report, most of his data sets only covered one or two years at a single location. He did note a couple that might have been a bit longer ( 6 or 8 years) but then did not plot a time series of this longer series, but instead focused on the 1-2 year studies. The basic accuracy of the Pettenkofer process was 0.0006 Vol% optimized to +/- .0003% (whatever that means) but my impression was that these chemical methods were good to +/-10ppm. Beside Keeling used the ones he wanted – they were good enough for him. So the 280 ppm could have been 180ppm to 380ppm. Maybe there is no problem! (joke). I found a very interesting reference on the Petenkofer method in a google search from the Archives of Public Health for University of Manchester, Vol. 1, 1906 with an article entitled : Atmospheric Carbonic Acid, its Estimation and Variation.” by John Robertson. In it he suggest that without extreme care, the error on the Pettenkofer method (which he refers to as the Dalton method due to a British bias) is about 90 ppm. He claimed to have gotten his personal error down to about 25 ppm. The paper also suggest that the Pettenkofer method was always biased high, eg. if he got a result of 325, the actual number (using more accurate, gravimetric methods) would be 300. For the time, an accuracy of less than 100 ppm sounds pretty darn good to me. The paper also discusses a number of the near surface features that were known to effect CO2 concentrations. Hopefully, this link will work, if not cut and paste. ONe thing I will give Beck credit for is that he has put all of his data and information sources out there for everyone to review at the link provided in comment 1. Well, I guess it is like all the other data in climate science. Pick what you like. I’ve given up. For example, I download UAH data a while back (Maybe 10 days) and then the data given in the link at Wattsupwith that yesterday. They are not identical! Close – but not identical. Hope you don’t mind, but I fixed up your link so the formatting is a little better. Supposing Beck’s data is biased, it might still be useful for estimating temperature-CO2 lags (that is, which came first, the increase in temperature or increase in CO2, etc.). And even, possibly, for trends. Dr Beck has done a momentous, astonishing amount of work to compile his dataset. It will be interesting to see what happens when other researchers start using it. I do agree that hopefully Beck’s efforts can be helpful in gaining a better understanding of early industrial age CO2 levels as well as the variability of CO2 levels near the ground surface. Unfortunately, trying to create a time series of disparate and possibly unreliable data to show that average atmospheric concentrations have varied wildly over the past 150 years was not an appropriate use of the data. For someone with a strong science background such as myself who by nature questions a whole bunch of stuff, one of the biggest frustrations is the lack of recognition on all sides of this issue that using bad science, questionable data, and then overstating the power of your case really helps no one. Both those that strongly advocate that the current warming trend will be “catasptrophic” and link every little weather calamity or change with AGW and those that try to argue that there is no evidence of any warming or that increasing CO2 levels can’t possibly lead to some amount of warming are equally quilty on this point. also took a turn down. You would think they may be related . Excellent, objective and data-driven discussion. I now have another blog I feel I have to keep up with! I dont have any upper atmosphere data. if anyone does, I would appreciate it. my understanding was that good c02 data did not start in the upper atmosphere until 2001, though I may be wrong. and the reference by fonselius in 1956.
suppose, every year, the exact same amount of new CO2 is added to the atmosphere. The graph for that would then be a straight line on our plot, which is roughly the case for the dates 1750 to 1800. During that time, about 0.12 ppm of new CO2 was added each year. At least, according to the estimates from ice cores. Surely this does not hold for the log chart. Surely this does not hold for the log chart? Suppose the amount added (new CO2) each and every year is 3 ppm, a straight line. Then on a log chart this would look like log(3), still a straight line, but of course at a different level. WHY oh Why is it that you not start at 0 in your first graph. This is called lying. Pet peeve of mine after having my papers bled upon for doing the same. Actually, my graphs start at less than 0. Which, of course, they had to since sometimes the rate was negative. Starting graphs at 0 is often a mistake, and can hide signal that you’re looking for. I have a good example of this under Bad Graphics. It’s this post. Not being a scientist, but reading this “There are even times when CO2 has decreased, i.e. removed from the atmosphere, from year to year (according to the measurements used): these are the points below the dotted-dashed line at 0. These times were roughly 1820, 1831-1838, times before wide-scale industrialization, and 1942-1944.” During WWII, one would expect the opposite. With smokestack factories at full force, cities and jungles burning, bombs and bullets going off, on the surface it goes against reason that CO2 would decrease. The man-made global warming crowd needs to actually look at data. Dr. Beck, hmm? I suppose that fits with the rest of it. And you tried so hard to seem reasonable a couple of weeks back over at Island of Doubt. But I’m afraid you’ve signed on to a dying industry. Well, yes. I haven’t seen his data set yet, though I have seem some commentary that it couldn’t possibly be any good. A refusal to look at the entire data set, to me, anyway, seems more unreasonable than a refusal to look. If I find there is nothing to it, or that it is somehow misleading, I will certainly say so. But I wonder: if instead it was found that his database was useful, not to measure the absolute value of CO2, say, but for measuring rates of change of CO2, would you be willing to examine that evidence? Technical note: suppose each station had it’s own bias, in whatever direction; as long as this bias was more or less a constant, we could still infer periods of increase and decrease; at any one station, this would not be interesting, but if we found the same thing at widely disparate stations (over the same time period), this would be interesting. Thanks very much for the links. Interesting papers. Australia has it’s own CO2 measurement station at Cape Grim. It confirms the readings from Mauna Loa are correct. The ice core values are going to be precise than the direct readings we have these days. It is only to be expected. Besides being a series of independent in time and place CO2 measurements, most of them are known to be at places with high local production (as well as human as vegetation). Some (Misra, India) were even taken intentionally in rice and soya fields, partly under the leaves, to measure CO2 activity during growing season. Where can we find background data: near/at all oceans (the CO2 exchange rate with the oceans is slow), above the inversion layer, and everywhere with sufficient wind speed. If we look at Beck’s data, only a few places are of interest (in the 1930-1950 period): ship’s surveys and near-coast in the North Atlantic (these data are around the ice core levels), near-coast in Scotland (370 ppmv, but no details known) and the Island of Wight (270 ppmv, no details known), Barrow (AK, USA) and the Antarctic coast. Unfortunately, Barrow used very inaccurate equipment (+/- 150 ppmv) and Antarctic data showed enormous variations in CO2, but also in O2 measurements. The biggest problem with Beck’s interpretation is the underlying assumption that a change of about +0.5/-0.1 degr.C caused a jump of 100 ppmv and back (the latter is physically near impossible), or about 200 ppmv/degr.C in about 7 years up and 1,000 ppmv/degr.C in 7 years down. The differences within the three cores were small, within +/- 1.2 ppmv (1 sigma). They also measured firn CO2 and noticed a lag of only 10 years between ice age and gas age at closing depth and an about 5 years smoothing for the two fastest accumulating cores (25-40 years for the third one, used for 1,000 years history). This refutes two of the allegations of Jaworowski: that the drilling method influences the CO2 levels and that the ice closing influences CO2 levels (closed and still open bubbles at closing depth had the same CO2 levels). Further, ice core CO2 levels and South Pole direct atmospheric measurements have an overlap of about 20 years (1959-1978) and are in the same range. This refutes another allegation of Jaworowski, that the ice core data and the atmospheric data were “arbitrarely” shifted with 85 years (for another ice core and Mauna Loa). The data series are based on ice age (by counting layers) and gas age (by following the firn diffusion rate). There is a big problem with looking at too short time frames, depending of the signal-to-noise ratio. The smaller the time frame, the bigger the noise (and the errors). If you take e.g. the seasonal changes by month-to-month averages, then temperature is certainly leading CO2 levels (inversely! ), due to the NH vegetation influence. Long-term trends are not visible in seasonal variations, as much smaller. If you take year-to-year variations (dCO2/dt), then we see that there are two components: the temperature-influenced variability (which is about +/- 1.3 ppmv) and the average increase, which is about halve the emissions (for the Mauna Loa time frame). I would appreciate anything you say about my web site and the conclusions I come to.